The composite image on the left shows X-ray and optical data for BP Piscium (BP Psc), a more evolved version of our Sun about 1,000 light years from Earth. Chandra X-ray Observatory data are colored in purple, and optical data from the 3-meter Shane telescope at Lick Observatory are shown in orange, green and blue. BP Psc is surrounded by a dusty and gaseous disk and has a pair of jets several light years long blasting out of the system. 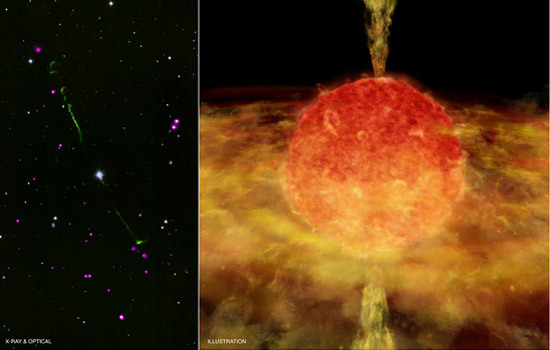 A close-up view is shown by the artist’s impression on the right.<br><br> The disk and the jets, seen distinctly in the optical data, provide evidence for a recent and catastrophic interaction in which BP Psc consumed a nearby star or giant planet. This happened when BP Psc ran out of nuclear fuel and expanded into its “red giant” phase.